"The Italian eating customs are worth knowing before you go out for a meal here"
The Italians take their meal times very seriously. There are a few Italian eating customs when it comes to eating out here. Meals aren't rushed here, and if you do rush it's seen as an insult to the chef, who wants you to stay as long as possible to enjoy the meal that he's put so much effort into. The meal consists of several courses with breaks in between to make it a drawn out, sociable affair. The first course is often either pasta, salad or soup. You'll also see melon with parma ham (which is lovely) and platters of various hams and cheeses. There will always be bread and/or breadsticks on the table, usually with olive oil to have with your first course. The second course is their main dish, consisting of fish or meat and various vegetables. Our favorite veg dish is courgette, aubergine (or eggplant), and peppers all grilled together in olive oil. Oh and by the way, what Italians call 'fried potatoes' is just chips or french fries! Of course there is always pizza as a main course too! 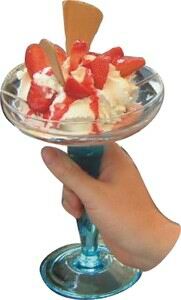 The third course, dessert, is often ice creams and fruits. This is then often followed by coffee. 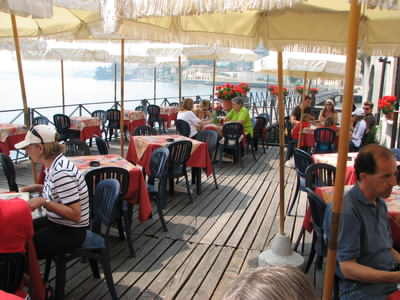 It is also worth mentioning that the warm climate and lovely surrounding make eating outside very popular. 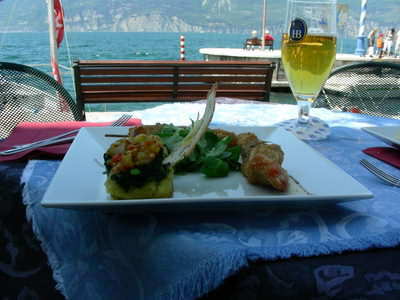 "Al fresco" dining by the lake is found in most towns and is strongly recommended. 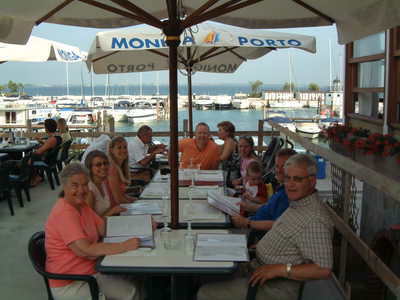 We can't get enough of eating by the lake when we are at Lake Garda. When your bill eventually comes, you'll notice a charge called 'Coperto' on it. This is a small cover charge for the bread and table setting, usually a couple of euros. Because of this, they don't expect you to leave a tip...but feel free to if you really want to! Sometimes we do if we feel that the service was exceptionally good, but most of the time we don't. Take a look at our Italian menu translator to see more foods that are often found on the menus here.